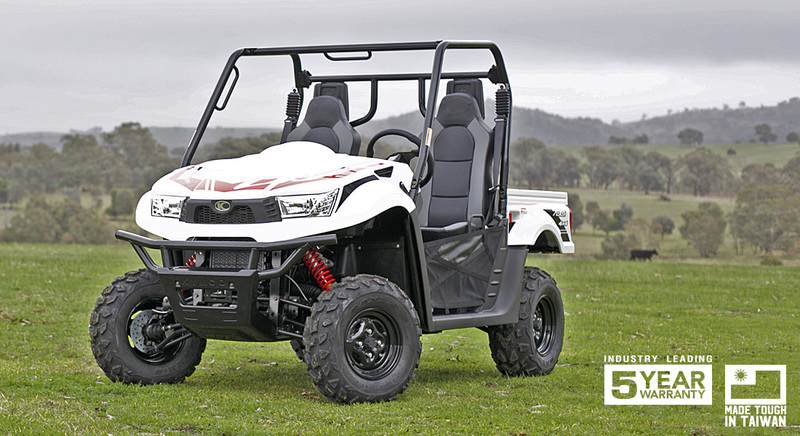 KYMCO Australia releases UXV 700i EPS side-by-side with new and improved work ready features. New features on the UXV include, revised EFI mapping and CVT-Drive system to improve the vehicles power delivery, resulting in a nice smooth and workable vehicle, perfect for day-to-day tasks on the farm. To aid in the vehicles already great off road ability, revised front lower A-Arms have been implemented to increase ground clearance to reduce the chances of getting hung up on rouge obstacles out in the paddock. A new roll cage and seat belt system have been added to create better headspace in the cockpit and increase overall occupant protection. New Kaifa gas reservoir shock absorbers are a standard feature with pre-load, compression and rebound adjustment to tailor the vehicle to your individual working needs. New ultra high back seats and new sports steering wheel design, aid for better comfort and driver support. KYMCO’s UXV 700i EPS is now available in White at $13,990 drive away. That’s an incredible $1000 less than its predecessor. Plus KYMCO Australia supports its range of ATV’s and side-by-sides with an industry leading 5-year warranty to guarantee A-Grade durability. Made tough in Taiwan with over 50 years experience, KYMCO vehicles are built to the highest standards with durable componentry, robust framework and a national support network. For further information on KYMCO’s UXV 700i EPS please get in touch with your local dealer or head to the Model Page.